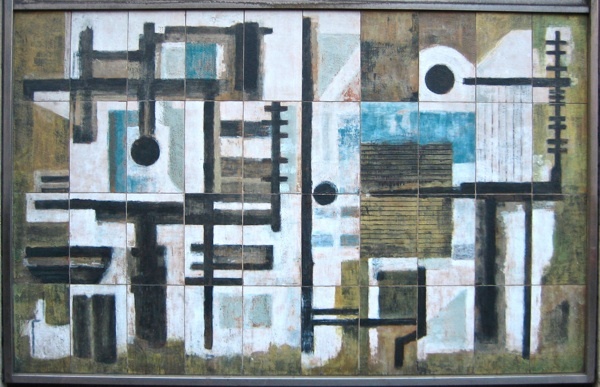 Wandering down under Holborn Viaduct yesterday, I was halted in my tracks by the beauty of a series of nine large ceramic murals upon the frontage of Eric Bedford’s elegant modernist Fleet House of 1960 at 70 Farringdon St. Their subtle lichen and slate tones suited the occluded November afternoon and my mood. Yet even as I savoured their austere grace, I raised my eyes to discover that the edifice was boarded up and I wondered if next time I came by it should be gone. Just up from here, there are vast chasms where entire blocks have disappeared at Snow Hill and beside Farringdon Station, so I would not be surprised if the vacant Fleet House went next. 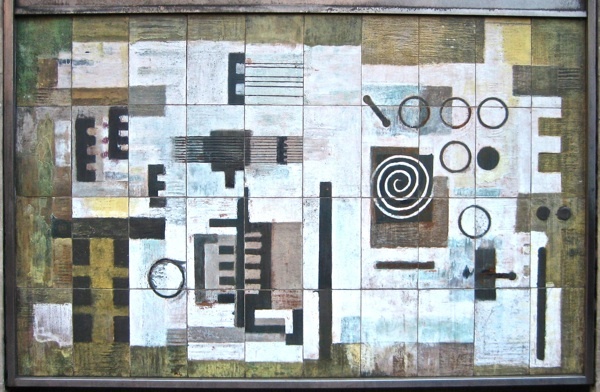 Each of the murals is constructed of forty bulky stoneware panels and it was their texture that first drew my attention, emphasising the presence of the maker. Framed in steel and set in bays defined by pieces of sandstone, this handcrafted modernism counterbalances the austere geometry of the building to sympathetic effect. Appropriately for the telephone exchange where the first international direct-dialled call was made - by Lord Mayor of London Sir Ralph Perring to Monsieur Jacques Marette, the French Minister of Posts, Telegraphs and Telephones in Paris at 11am on 8th March 1963 - these reliefs celebrate the wonders of communication as an heroic human endeavour. In 1961, the General Post Office Telephonist Recruitment Centre was housed here and they paid telephonists £11 week, plus a special operating allowance of six shillings and threepence for those employed on the international exchange. 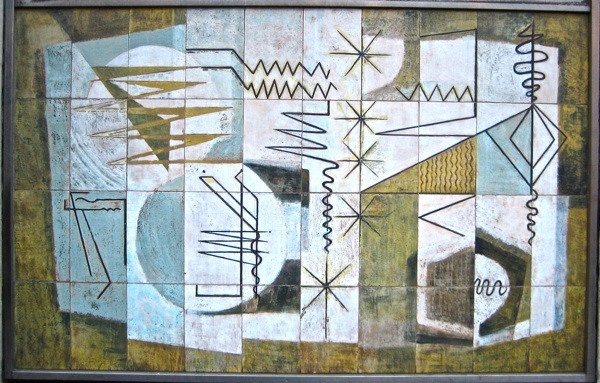 These appealing works, enriching the streetscape with complex visual poetry, were created by Dorothy Annan (1908-1983) a painter and ceramicist with a bohemian reputation who, earlier in the century, produced pictures in a loose post-impressionist style and was married to the sculptor Trevor Tennant. 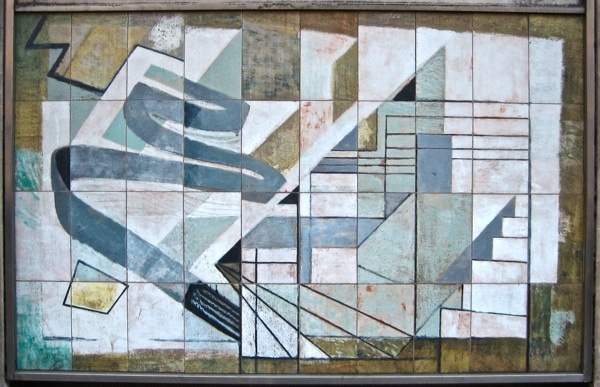 Although her work is unapologetic in declaring the influence of Ben Nicholson and Paul Klee, she succeeded in constructing a personal visual language which is distinctive and speaks across time, successfully tempering modernism with organic forms and a natural palette. 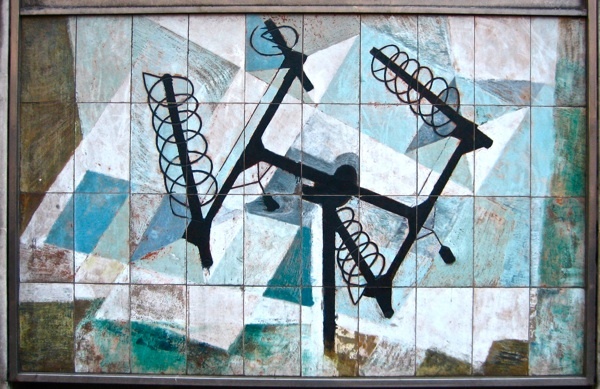 It was the abstract qualities of these murals that first caught my eye, even though on closer examination many contain figurative elements, illustrating aspects of communication technology – motifs of aerials and wires which are subsumed to the rhythmic play of texture and tone, offering a lively backdrop to the endless passage of pedestrians down Farringdon St.
Once a proud showcase for the future of telecommunications, Fleet House has been empty for years and is now the property of Goldman Sachs who have their own plans for the site. 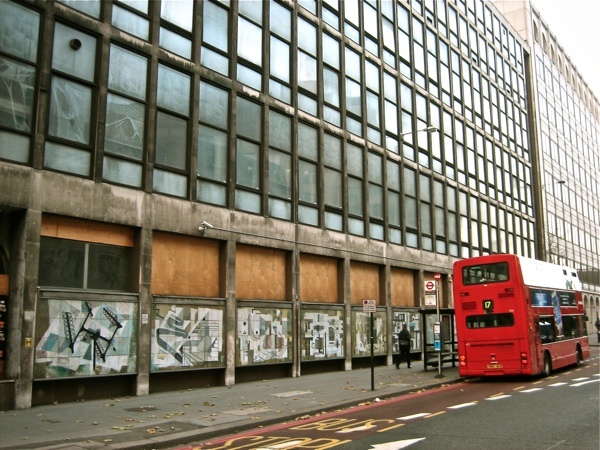 Yet although the building is not listed, the City of Londoners planning authority have earmarked the murals for preservation as a condition of any future development. But if you want to see them as Dorothy Annan intended them, you would be advised to take stroll down under the Holborn Viaduct soon – because this could be your last chance. I’m utterly charmed by these murals. I’m glad that they are ear marked for preservation even if the building holding them gets demolished. Then future generations will still get to see 1960′s craftmanship. A brilliant article. I drive past these murals just about every single working day. So sad to see them in such derelict surroundings. Thanks for bringing their attention to wider audience. I was a chorister at St. Paul’s Cathedral 1962-1967 when this was a new building. I remember being fascinated by these murals: they must have represented something of the excitement of new technology to this (then) 9-year old. Because of the restrictions on crossing main roads that we had to obey I was unable to examine them closely and it wasn’t until I actually worked in Fleet Building some four decades later that I had the chance to do so. The building even then was somewhat run-down, and the old Strowger exchange equipment was being junked, the staff canteen closed down, and clearly BT was not considering a long future for the building and I must say I have always been concerned for the future of the ceramics. I’d hoped the Museum of London might get involved as I think they would make a fairly spectacular display along an entrance wall. And the work itself? Well, Spitalfields Life refers to the ‘subtle lichen and slate tones’. I’d like to agree with the relation to season and mode but it wasn’t so. Age and exposure has faded the colours a lot, and I remember, for example, a lot brighter reds and vivid yellows. Perhaps somebody wih Photoshop skills could have a go at recreating these. There must surely be some contemporary (unfaded) colour photographs kicking around in an archive at BT or a newspaper somewhere. I can’t speak authoritatively of the aesthetics (not my area) but the panels seem to me to be a very good response from an artist to technology and the exciting possibilities it held. We were, after all, in an era looking for hope wherever we could find it and technology spawned much. Remember ‘Telstar’ by the Tornadoes? 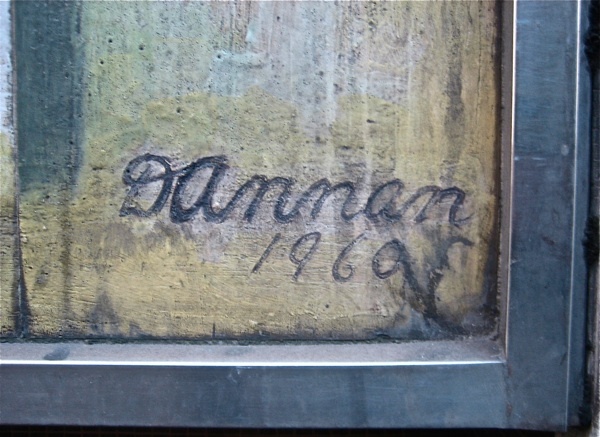 1962 – when this building and its murals were still fresh. 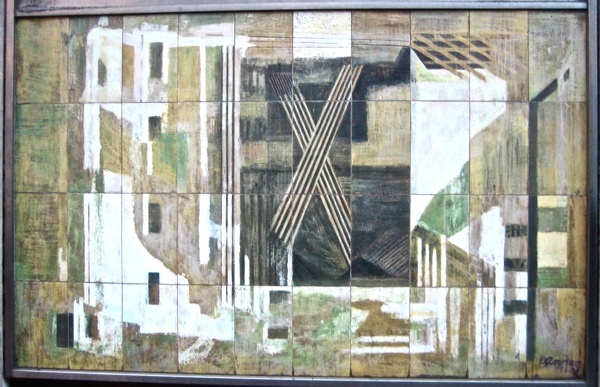 The key interest for me now is that the murals must be among the last examples of achitectural decoration reflecting the actual function of the building. Previous corporate architecture had done so, and many other buildings in the City attest to this, from motifs on the exterior of the livery company halls, to the dolphin(?) weathervanes on the old Billingsgate market. But most buildings since have been comissioned with an eye to eventual disposal, so links to a particular enterprise have been discouraged. There have been exceptions, of course, like the notorious NatWest tower (now Tower 42) where the bank logo shapes the building footprint – and is visible only from the air! But it’s only structures like concert halls, galleries and so on that can take that route now. Thanks, of course, for bringing attention to an old friend. 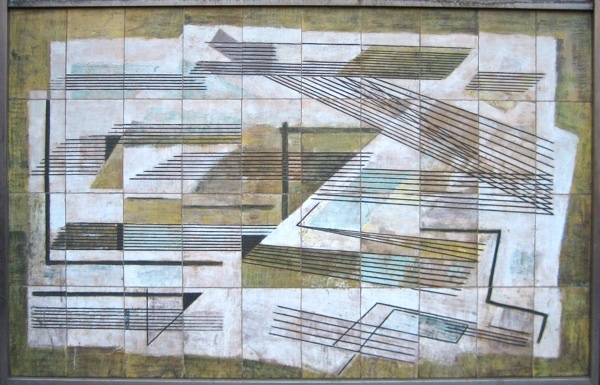 some of the best street artists work reminds me of this work ,I see a direct link between Giotto ,cave paintings , paintings in the street and this wonderful work , its outsideness bringing it a special poeticness……it has been walked by so many times as part of the streetscape. The murals are lovely, but the building is hideous. The whole area is being transformed at the moment, but not with inspiring architectural gems. Corporate offices by corporate architects who lack any real vision or feeling for this part of London are popping up. It’s a tragedy, but I live in hope that one day someone will stand firm and create an urban environment we can all love and treasure. In the meantime I’ll enjoy the murals while I can. I actually like the building as it is, much preferable to the corporate offices by corporate architects as last reader describes well! Really want to see these murals as they are… could anyone tell me if they are still there Jan 2012? (It would be a trip down from Leeds for me). Many thanks… lovely photographs. 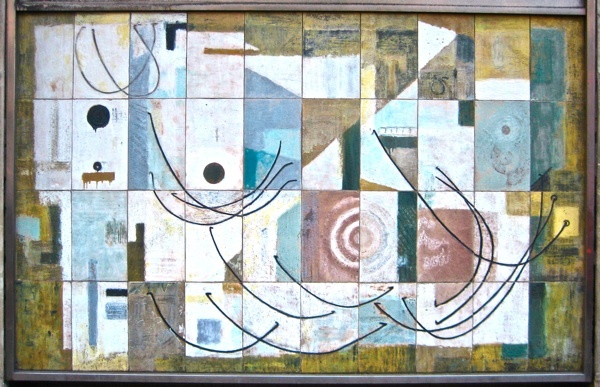 So pleased to learn these panels may be placed on a Barbican Highwalk. Need a little TLC. 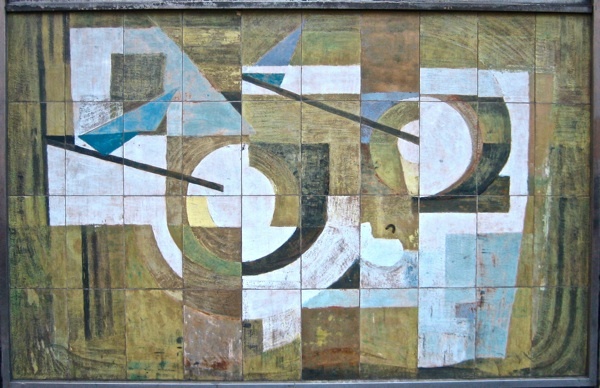 These murals have now been installed at the Barbican (quite near the Gilbert Bridge). They look great in their new home – but could be better lit. It looks like the installation is complete, with illuminations, along Speed Highwalk. The electricians were working late tonight. The murals carry quite a bit of history with them, it wouldn’t be out of place to have a discreet plaque…I don’t know if that’s on the horizon?